It’s a very tough time, no one can deny that. I just had a look at the 2016 English HSC paper and I could feel my body start to tense up with the memory of when I sat the HSC – 30 years ago, yikes! I remember being so stressed-out, that my mother found me sleep-walking with a pen in hand and mumbling something while rummaging through papers sprawled all over my desk. It was hard enough then, without the barrage of social media to contend with. It was 1987 and the only technological distractions I had was an episode of Family Ties and the Bangles playing on my cassette tape deck. These days of course there’s copious distractions (some good, many stressful) with social comparisons and peer-pressure intensified by 24-hour access to ‘life’ as it unfolds on every device imaginable. But alas, that is how it is today and it is up to us to judge whether these things give us pleasure or add to the load of daily hassles. Certainly, while we all reap the benefits and convenience of modern life, there are times when life demands our utmost attention and focus – and the pressure is on. 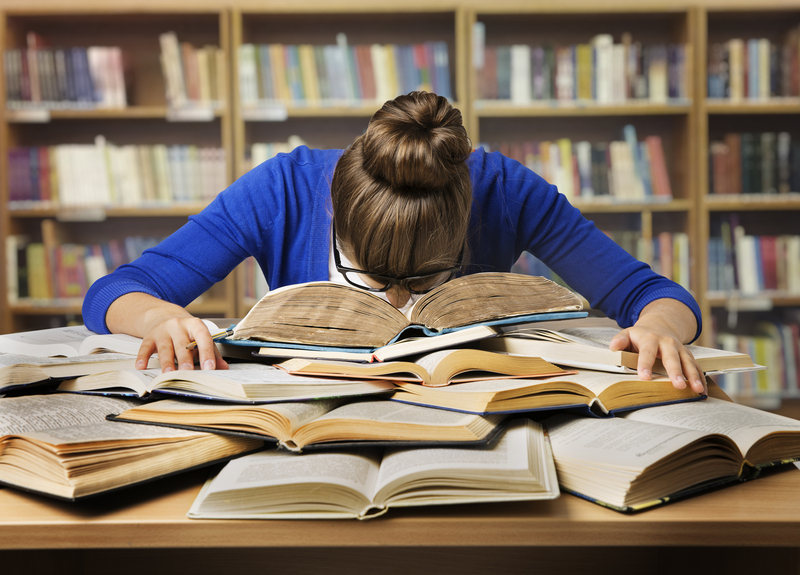 For a student, the HSC is one of those times, and decisions need to be made about how best to manage time spent and how best to handle feelings of stress and anxiety. So, to the HSC student, good luck and best wishes. You can get through this time, you might just need to pare down the many distractions around you and focus on your own self-care and what really matters at this time. So, you’ve done all the preparation, you’ve even sat your first exam. Well done. Don’t forget, you deserve to do well and you can do well, just give it your best on the day and oh yes, slow down! Your mind is probably racing a hundred miles an hour. Your thoughts, hopes, fear, worries, and those dreaded comparisons – you can hardly keep up with them all. Now is the time to slow it all down! Just remember, whatever you hear, think, read and see on whatever device you are looking at, is NOT necessarily true. You don’t know and will never really know how someone else is coping, how well they did and how easy or tough they found the exam. This is all peripheral stuff that’s most likely only going to fuel your worry. You should stay connected with people sure, but try not to buy into any of the ‘hype’ of comparing yourself to others – this never really goes well. For now, stay focused on you: your strengths, your health, your diet, your exercise, your exams, your study, your LIFE! Here’s a few tips that can help you navigate the road ahead. But also remember, this is a part of your life (yes an important part of your life), it’s not your whole life and no matter what the outcome is for you it will not dictate your future happiness or success. There are multiple opportunities and paths you can take to get you where you want to go. So slow down, relax, give it your best, but stay well and with an open mind. Get organised. Have your desk sorted and clear with just what you need. Chunk it up. Set yourself chunks of time to work on certain things. Have small set tasks or goals. You need to have a plan for your study otherwise you’ll get too distracted and try to do too much and just get anxious and overwhelmed. Factor in those breaks. After you have finished a chunk, have a short break where you move your body or have a refreshment. A short intense walk can send much needed oxygen and blood flow to the brain. Watch what you eat. Give the sugary breakfast cereal a big miss and go for a high protein breakfast. Make sure you eat as much ‘mind food’ as possible. Things like nuts, berries, cheese, eggs, salmon, chicken, green veges avocados (and dark chocolate) are going to help get you through. Decrease the sugar, especially on exam days – it’s so not good for your brain! Imagine you are there. Relax, close your eyes and imagine calmly being in the exam room and completing the paper. Above all, imagine that you are relaxed, breathing calmly, reading and thinking clearly. Rest and get some good sleep. Call it a day, when you need to. At some point you need to stop for the day. Don’t work in bed! Keep your bed for rest and leave your phone (and whatever other device you have) powered in another room. I know this is hard, but really, your mental health needs a boundary. You need to close off for the night. Try stretches, hot shower or bath, yoga, a relaxation or mindfulness app, essential oils (eg, lavender and orange really work for sleep) and a cup of warm milk (it’s not just an oldwives tale you know) to relax your body and mind before bed. Don’t worry if you can’t or don’t do the things on this list. Give yourself a break and watch your inner critic. There’s no need to judge yourself harshly for doing all the so-called right things! Just do what you can and you’ll be OK. Remember to breathe. Just take a few minutes to watch your breath. If you need to take a few slow deep breaths to start with then do that. Once they are done, come back to your breath and breathe gently and normally through your nose. Be kind to yourself. When things are getting started, notice how you feel. Name your feelings quietly to yourself (eg, I’m feeling a little anxious, I can feel it in my chest”). Even the act of doing this actually sends messages back to the emotion centre of your brain to calm things down. After that, try saying something soothing to yourself by letting your compassionate mind speak (eg, I know I’m feeling anxious, this is pretty normal and its ok. I know this feeling will pass soon). When you see the questions, take it slowly and read all the instructions carefully. This is when a lot of students notice a marked elevation in their anxiety. I like the ‘read question – read the piece/or text – read question again’ approach (for example in an English exam or where there is a reading for you to complete before you answer set questions). If you have a worksheet, write key words as you read the piece for example and always highlight key parts of the question as you read through it. Take your time to really understand what is being expected of you with each question. “What exactly is being asked of me here?” Planning a little upfront is usually very predictive of success. Multiple choice questions are there to ‘trick’ you. A great tip is to always cover the choices first. Read the question before you let yourself see any of the answer choices. When you read the question, try and generate the most accurate answer in your mind first, then allow yourself to see the options. This is an ‘answer generation’ technique which has been proven in educational psychology to get the best results. Do something nice for yourself. Have a break and maybe a nice little reward! Debrief but don’t ruminate. Sure, get things off your chest but don’t spend a long time talking to your fellow students about the exam. Move on! Talk to your parents and other helpful person to get things off your chest. Take a break before starting on preparing for the next exam. Get some physical exercise, get some sunshine and do something different, even if it’s just for an hour. Try and remember to take good care of yourself across all domains of life. Check in with your parents or other people you can talk to and try not to spend all your time in your room. Remember that there are people who care about you and how you are coping, so always seek out helpful, useful people to speak with and share your concerns. Also know that a certain amount of anxiety and worry is very normal and usually passes once the exam period is over. If you feel that you are so anxious that you can’t focus at all or you are starting to feel down or sad for any longer than a couple of days, talk to your parents about getting some further help. It might be that a professional can help you with strategies and skills to deal with anxiety or low mood. It’s never too early or late to ask for help. Dr Gemma Gladstone is a clinical psychologist and certified schema therapist, supervisor and trainer with over 20 years’ experience in mental health. She is also co-director of The Good Mood Clinic in Bondi Junction, Sydney.